Dr. Dawn Greenberg received her DVM from Cornell University in 2006, and has been practicing western medicine since then. 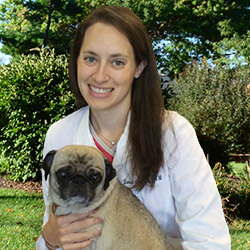 She began her career at a busy veterinary hospital in Washington, DC, then continued working at Dix Hills Animal Hospital after moving back to Long Island in 2011 to raise her family. Dr. Dawn left conventional practice and now provides Chinese Medicine exclusively, limiting her practice to Acupuncture and Chinese Herbal Medicine. Those who know her have seen how devoted and warm she is toward patients and their parents. Dr. Dawn provides superior veterinary care, and you will be hard pressed to find a veterinarian with a better bedside manner. She takes the time to get to know her patients and their parents, because she genuinely cares. Dr. Dawn is passionate about keeping animals healthy and pain free, especially as they age. Frustrated with the limitations of conventional medicine, she sought a new approach and found that integrating eastern and medicine was the answer. Dr. Dawn undertook rigorous training in veterinary acupuncture at the Chi Institute in Reddick, Florida. She trained under the world renowned Dr. Huisheng Xie, a leading expert in Traditional Chinese Veterinary Medicine, and became a Certified Veterinary Acupuncturist for dogs, cats, and horses. Dr. Dawn is in the Masters Program at the Chi Institute, and she is currently training in Chinese Herbal Medicine. She in the process of becoming a Certified Veterinary Chinese Herbalist. When she is not taking care of her patients, Dr. Dawn is busy with her family - husband and two young boys, who have a lot of energy and love to play sports. The newest member of the family is Juniper, a much adored pug puppy.